There are some amazing wallpapers out there. And the big bold patterns that were used for the "feature wall" are now being used to cover all 4 walls! 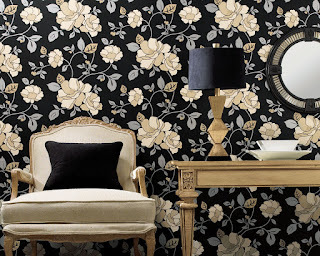 Galerie, Harlequin, Linwood and Zoffany have some of the best selections around. The paper shown is by Galerie, and the same collection has subtle patterns and minimal stripes to co-ordinate if the thought of such a big pattern on all walls is overwhelming.